VASA (Automotive Air conditioning, Electrical and Cooling Technicians of Australasia) is a not-for-profit association, formed by aftermarket vehicle air conditioning specialists in 1993 to encourage best practice repair procedures, continuous learning and ethical conduct. It also looks after the interests of aftermarket technicians through representation on key industry regulatory bodies and government liaison. When factory-installed air in all new cars took over from aftermarket installation, VASA extended its charter to embrace auto electricians, and eventually heat exchange repairers. This was partly achieved through the merging of the original body, the Vehicle Air-conditioning Specialists of Australasia and the Australian Association of Automotive Electricians in 2005. VASA membership extends throughout Australia and New Zealand and comprises mainly service workshops and technicians, but also includes parts wholesalers, equipment manufacturers and educators. Pioneer awards were inaugurated in 1996 to recognise those who have contributed to standards, innovation and growth of the industry. These awards are not ONLY about years in service. 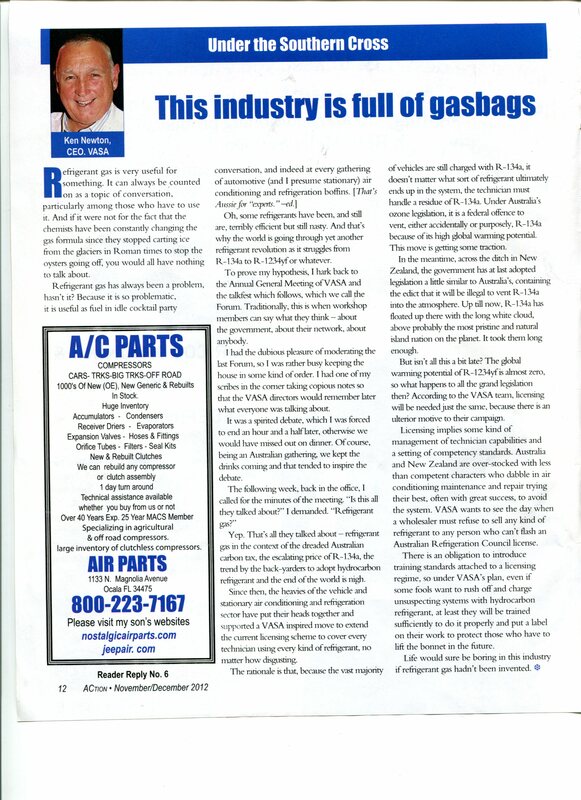 They are about people who contributed something extra by way of innovation with components, or quite often they challenged the way things are done and brought about a mini-revolution of their own in air conditioning sales, parts or practice. If you would like to nominate someone for this award, please contact VASA. Please select an award winner from the list below. In 2005, the then VASA president Mark Padwick and CEO Ken Newton forged a strong alliance with MACS Worldwide at their convention in Las Vegas, agreeing to share ideas and philosophies and generally working for the common good across the Pacific. 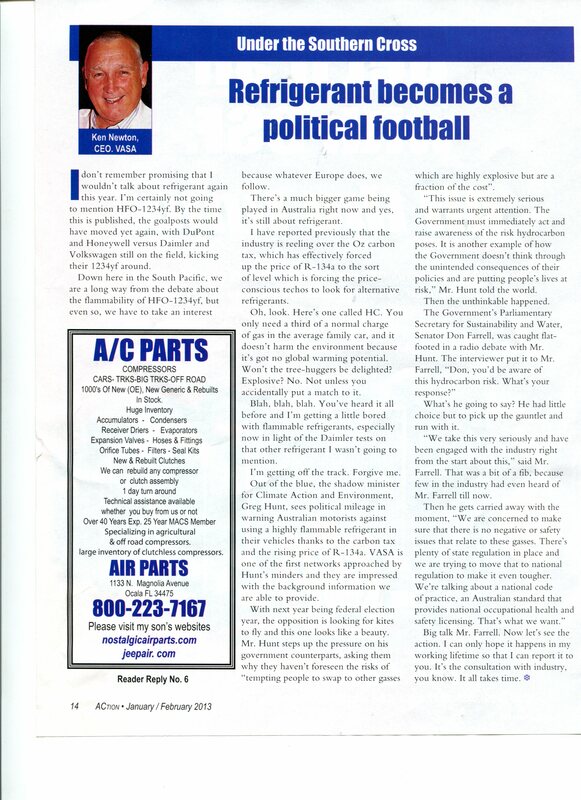 As part of the deal, Ken Newton, a journalist by profession, began writing a regular feature for the MACS Action magazine, and this has continued to this day, in every issue. Ken’s satirical, no-holds-barred style has made him a valued contributor to the MACS scene. His readers love his Oz larrikinism, and his work has been honoured by four awards (two bronze and two silver) in the International Automotive Media Awards. Ken’s regular summary of VASA’s work and the auto air conditioning climate ‘down under’ has become a chronicle worth preserving. So if you are looking for a good read, pour yourself a drink and settle down for a good chuckle and a rare insight into VASA’s struggles on behalf of its members. Diversification is fine, but can I make some money too?